holds well Archives - What the Forks for Dinner? Turkey day is next week! Are you ready?? Looking for a make-ahead salad that can stand buffet time? 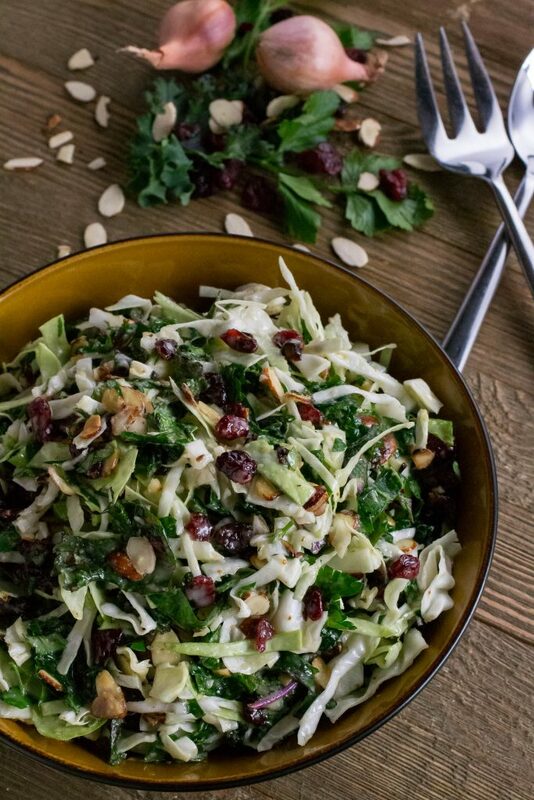 Turkey Day Slaw is just the recipe you need for your Thanksgiving Day feast. 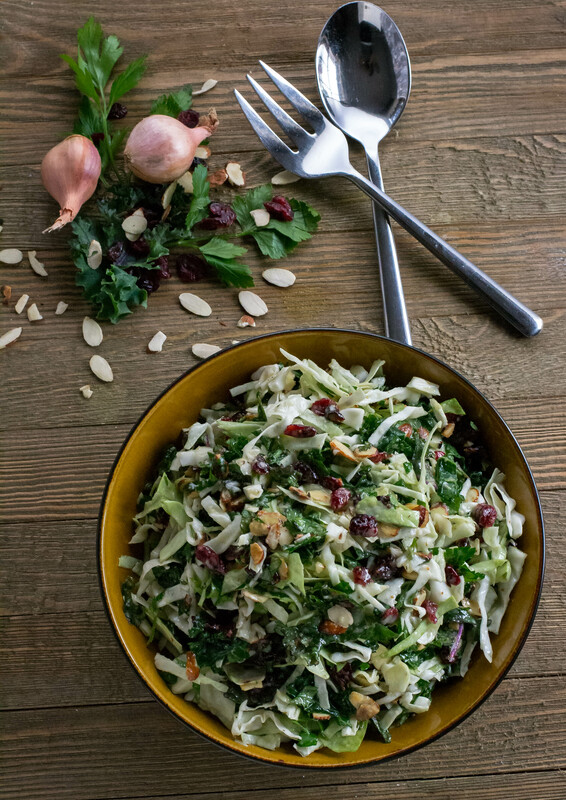 Simple to prepare, Turkey Day Slaw holds exceptionally well. Fresh good for you ingredients adds a light side dish to the traditionally more substantial fare of the day. Freshly shredded cabbage and kale give this dish a dash of healthiness, but they hold well and will not wilt like regular lettuce type salads. 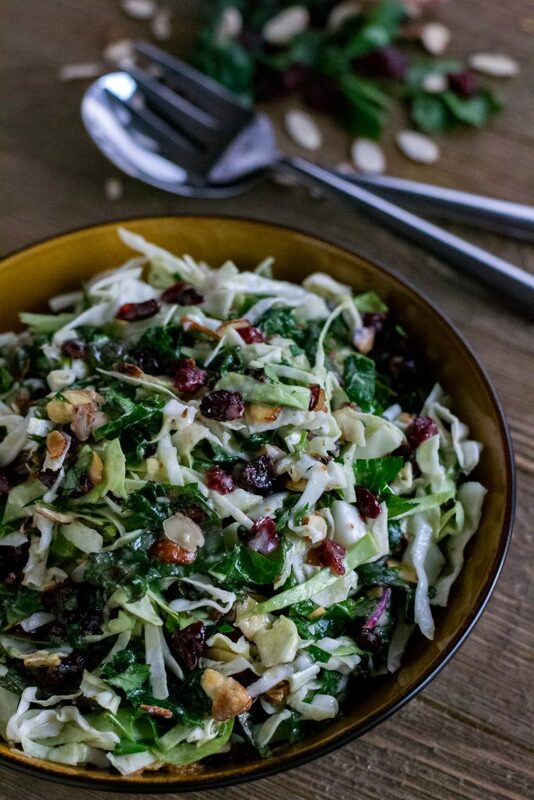 Dried cranberries add a sweet tartness, and toasted almonds add extra crunch. Italian parsley adds an extra freshness. A simple vinaigrette made from a neutral oil ( I like avocado oil for taste and health), apple cider vinegar, apple cider, two types of mustard, a touch of maple syrup, and shallots dress Turkey Day Slaw to a tee. 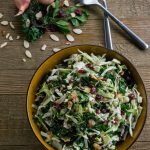 Make Turkey Day Slaw the night before, and it will still be fresh for family and friends on Turkey Day. You can also prepare all the ingredients the day before and toss right before serving. This recipe makes enough for eight or more, so of course, we had leftovers. Even two days later the slaw was still good. I would not recommend making it that far in advance, but if anything the flavors had a chance to blend even more. Great for leftovers. Quick, simple make-ahead Turkey Day Slaw is the perfect Thanksgiving day salad. Make the dressing: Whisk the oil, and the next 6 ingredients together in a small bowl. Add the shallot stirring to combine. Alternately you can place all ingredients in a blender and blend until smooth Let sit while preparing the salad mixture. 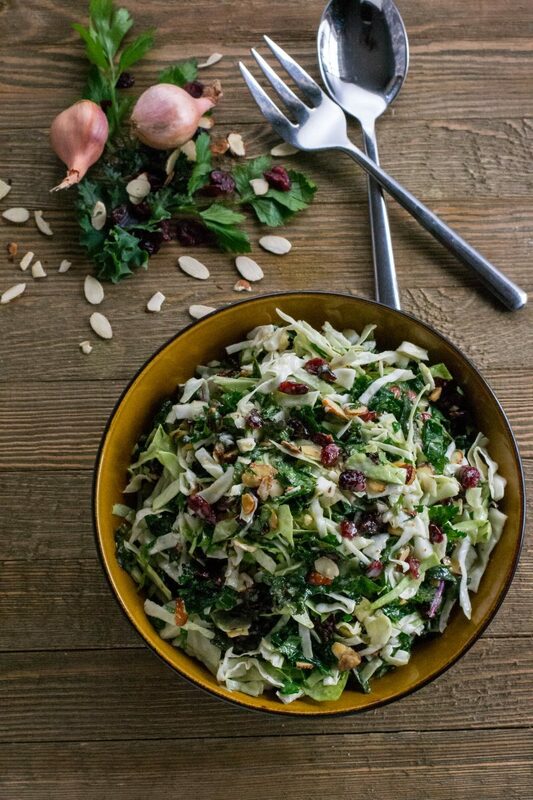 Make the salad: Place kale in a large bowl and add about 1/3 a cup of dressing. Massage the dressing into the kale. 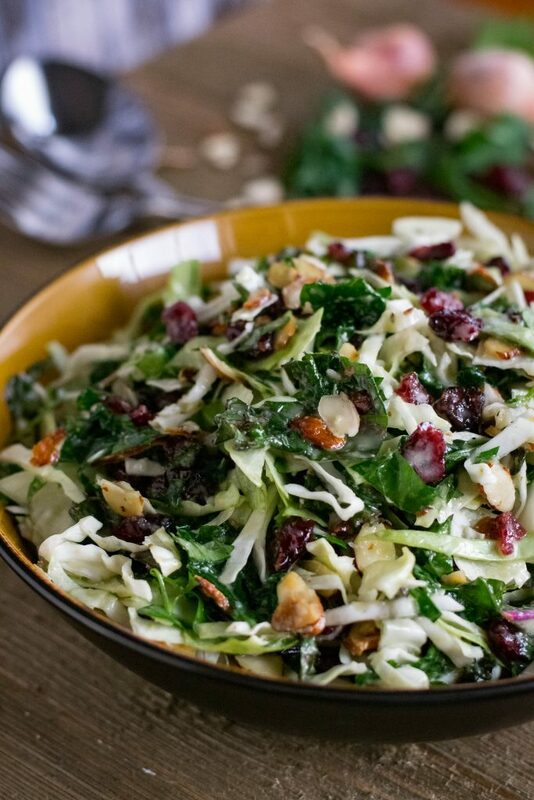 Add the shredded cabbage, almonds, cranberries, and parsley to the kale and toss to combine. Pour remaining dressing over the salad and stir to coat mixture with dressing. Adjust seasonings as needed.